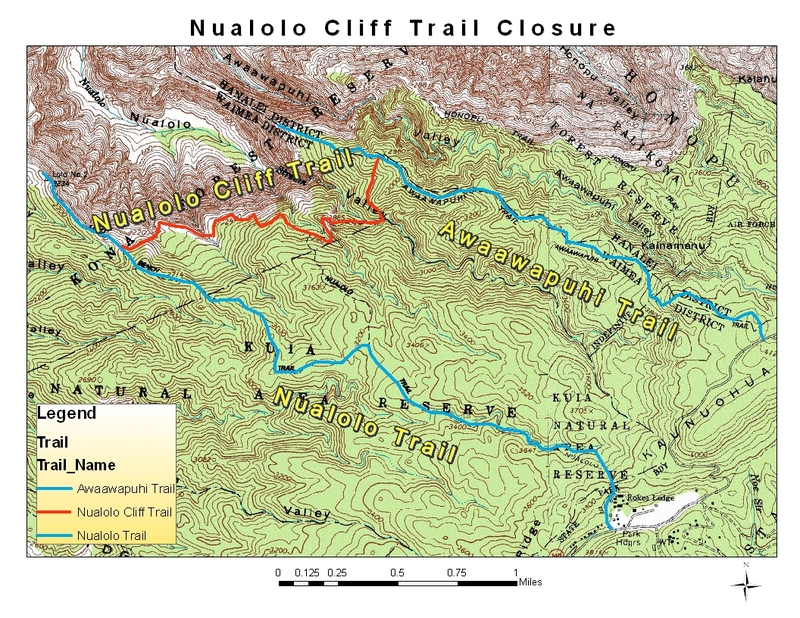 LIHUE — Effective May 9, the Department of Land and Natural Resources (DLNR) will close for an indefinite period the 2.1 mile long Nualolo Cliff hiking trail in the Na Pali-Kona Forest Reserve on the north-west coast of Kauai. The trail closure is due to unsafe trail conditions including washed out and eroded trail near the 1.5 and 1.75 mile markers. The trail tread is only six inches wide in some places. DLNR Division of Forestry and Wildlife Na Ala Hele Trails program staff will post trail closure signage and install temporary barriers for public safety. The public is advised to heed the warning signs and barriers and stop using the trail. The Nualolo Cliff trail starts near the 3 mile point on the Awaawapuhi Trail in the Na Pali-Kona Forest Reserve and meets the Nualolo Trail between the 3 mile and 3.25 mile markers. The trail skirts the upper rim of the precipitous Nualolo Valley and permits a “loop” route from the Awaawapuhi Trail to Kokee Park Headquarters or vice versa.